Cumulonimbus clouds are dense, towering vertical cloud, forming from water vapour carried by powerful upward air currents. If observed during a storm, these clouds may be referred to as thunderheads. Cumulonimbus can form alone, in clusters, or along cold front squall lines. These clouds are capable of producing lightning and other dangerous severe weather, such as tornadoes. Cumulus clouds are puffy clouds that sometimes look like pieces of floating cotton. The base of each cloud is often flat and may be only 1000 meters (3300 feet) above the ground. The top of the cloud has rounded towers. When warm, moist air rises, water vapour eventually cools and condenses on particles called condensation nuclei into tiny water droplets. As the process continues, water droplets continue to accumulate upwards, creating heaps visible in the sky as white, fluffy clouds. 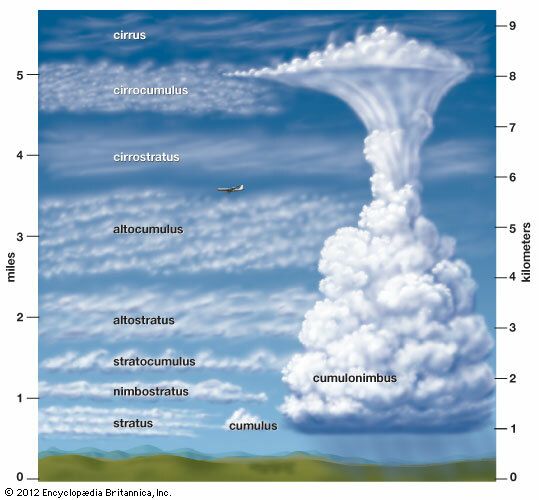 A stratocumulus cloud are rounded masses, usually in groups, lines, or waves, the individual elements being larger than those in altocumulus, and the whole being at a lower altitude, usually below 2,400 meters (8,000 ft). Stratus clouds more specifically, the term stratus is used to describe flat, hazy, featureless clouds of low altitude varying in colour from dark gray to nearly white. 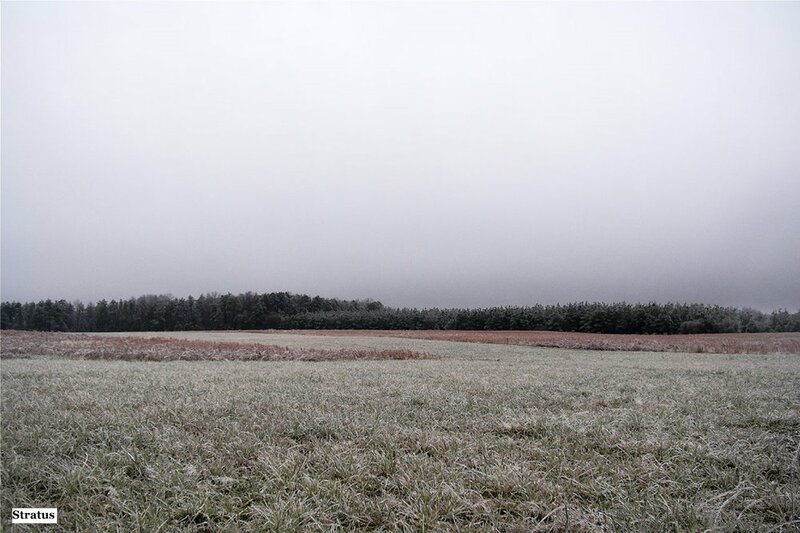 Stratus clouds may produce a light drizzle or a small amount of snow. These clouds are essentially above-ground fog formed either through the lifting of morning fog or through cold air moving at low altitudes over a region. Some call these clouds "high fog" for the fog-like cloud. While light rain may fall, this cloud does not indicate much meteorological activity. Towering altocumulus, known as altocumulus castellanus, frequently signals the development of thunderstorms later in the day, as it shows instability and convection in the middle levels of the troposphere( the lowest layer of the atmosphere), the area where towering cumulus clouds can turn into cumulonimbus. Altocumulus generally forms about 2,000 to 6,100 meters (6,600 to 20,000 ft) above ground level, a similar level to altostratus formations, and satellite photography has revealed that the two types of cloud can create formations that can stretch for thousands of square miles. Nimbostratus although it is usually a low-based cloud, it actually forms most commonly in the middle level of the troposphere and then spreads vertically into the low and high levels. Nimbostratus usually produces precipitation over a wide area. Cirrus cloud is atmospheric cloud generally characterized by thin, wispy strands. This cloud can form at any altitude between 16,500 ft (5.0 km) and 45,000 ft (14 km) above sea level. The strands of cloud sometimes appear in tufts of a distinctive form referred to by the common name of mares' tails. On planet Earth, cirrus generally appears white or light grey in colour. It forms when water vapour undergoes deposition at altitudes above 5,500 m (18,000 ft) in temperate regions and above 6,400 m (21,000 ft) in tropical regions. Since cirrus clouds arrive in advance of the frontal system or tropical cyclone, it indicates that weather conditions may soon deteriorate. While it indicates the arrival of precipitation. Cirrus clouds form on other planets, including Mars, Jupiter, Saturn, Uranus, and possibly Neptune. They have even been seen on Titan, one of Saturn's moons. Some of these extraterrestrial cirrus clouds are composed of ammonia or methane ice rather than water ice. Cirrocumulus cloud usually occur at an altitude of 5 kilometres (16,000 ft) to 12 kilometres (39,000 ft). Like lower altitude cumuliform and stratocumuliform clouds, cirrocumulus signifies convection. Unlike other high cirrus and cirrostratus, cirrocumulus includes a small amount of liquid water droplets, although these are in a super cooled state. Cirrocumulus clouds are usually short-lived. Cirrostratus cloud is a high-level, very thin. It is difficult to detect and is capable of forming halos when the cloud takes the form of thin cirrostratus nebulosus. On the approach of a frontal system/ weather front, the cirrostratus often begins as nebulosus cloud and turns to fibratus cloud. Cirrostratus is usually located above 5.5 km (18,000 ft). Its presence indicates a large amount of moisture in the upper atmosphere. Cirrostratus clouds sometimes signal the approach of a warm front if they form after cirrus and spread from one area across the sky, and may be signs that precipitation might follow in the next 12 to 24 hours or as soon as 6–8 hours if the front is fast moving. Noctilucent clouds are tenuous cloud-like phenomena in the upper atmosphere. They are made of ice crystals and are only visible in a deep twilight. Noctilucent roughly means night shining in Latin. They are most commonly observed in the summer months at latitudes between 50° and 70° north and south of the equator. These clouds can be observed only during local summer months and when the Sun is below the horizon for the observer, but while the clouds are still in sunlight. They are the highest clouds in Earth's atmosphere, located in the mesosphere at altitudes of around 76 to 85 kilometres (47 to 53 mi). Noctilucent clouds are not fully understood and are a recently discovered meteorological phenomenon; there is no confirmed record of their observation before 1885, although they may have been observed a few decades earlier by Thomas Romney Robinson in Armagh. Noctilucent clouds can form only under very restricted conditions during local summer; The occurrence of noctilucent clouds appears to be increasing in frequency, brightness and extent. Mammatus cloud is a cellular pattern of pouches hanging underneath the base of a cloud, typically cumulonimbus rainclouds, although they may be attached to other classes of parent clouds. They are formed by cold air sinking down to form the pockets contrary to the puffs of clouds rising through the convection of warm air. These formations were first described in 1894 by William Clement Ley. A funnel cloud is a funnel-shaped cloud of condensed water droplets, associated with a rotating column of wind and extending from the base of a cloud (usually a cumulonimbus or towering cumulus cloud) but not reaching the ground or a water surface. Funnel clouds form most frequently in association with supercell thunderstorms. If a funnel cloud touches the ground it becomes a tornado. Most tornadoes begin as funnel clouds, but many funnel clouds do not make ground contact and so do not become tornadoes. Lenticular are often comparable in appearance to a lens or saucer. they have been brought forward as an explanation for some unidentified flying object (UFO) sightings. As air travels along the surface of the Earth, obstructions are often encountered. These include both natural features of the Earth, such as mountains or hills, and man-made structures, such as buildings and other structures. An arcus cloud is a low, horizontal cloud formation, usually appearing as an accessory cloud to a cumulonimbus. Roll clouds and shelf clouds are the two main types of arcus. Arcus clouds most frequently form along the leading edge or "gust fronts" of thunderstorm outflow. Undulatus asperatus is a cloud formation first popularized and proposed as a type of cloud in 2009 by Gavin Pretor-Pinney of the Cloud Appreciation Society. Added to the International Cloud Atlas as a supplementary feature in March 2017, it is the first cloud formation added since cirrus intortus in 1951. Although they appear dark and storm-like, they almost always dissipate without a storm forming. The ominous-looking clouds have been particularly common in the Plains states of the United States, often during the morning or midday hours following convective thunderstorm activity. Polar stratospheric cloud or PSCs, also known as nacreous clouds, or mother of pearl, due to its iridescence), are clouds in the winter polar stratosphere at altitudes of 15,000–25,000 meters (49,000–82,000 ft). They are best observed during civil twilight when the sun is between 1 and 6 degrees below the horizon as well as in winter and in more northerly latitudes. They are implicated in the formation of ozone holes. A wall cloud is a large, localized, persistent, and often abrupt lowering of cloud that develops beneath the surrounding base of a cumulonimbus cloud and from which tornadoes sometimes form. It is typically beneath the rain-free base (RFB for short) portion of a thunderstorm, and indicates the area of the strongest updraft within a storm. Rotating wall clouds are an indication of a mesocyclone in a thunderstorm; most strong tornadoes form from these. Many wall clouds do rotate, however some do not.